The parish church of St Mary the Virgin at Cogges (Oxfordshire) is a simple Saxo-Norman structure with aisles added c.1180 and spacious chancel with a crypt of c.1240. By the thirteenth century the church may have served both the parish and the adjacent Cogges Priory. During the 1340s John, 1st lord Grey, added an opulently decorated north chapel to house the tomb of his mother, Lady Margaret. The chapel almost certainly also accommodated a chantry to commemorate her soul, although no foundation document survives. 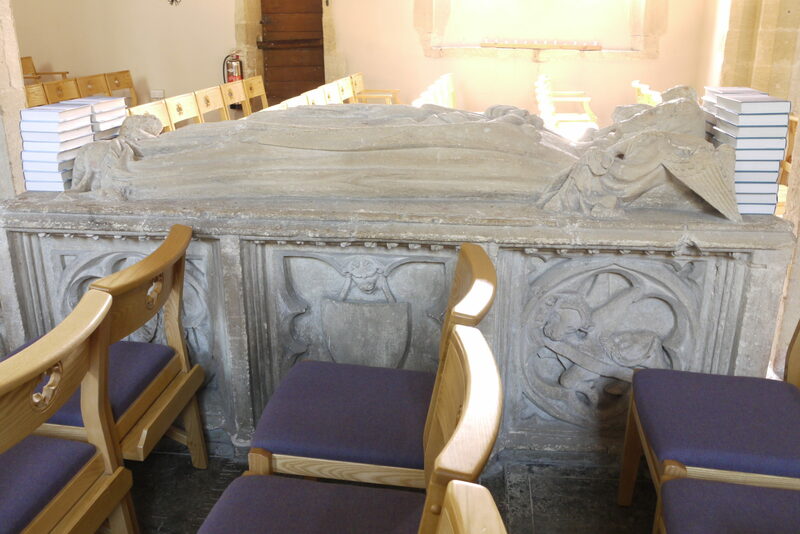 The chapel, which has an open arcade to the chancel, was two bays in extent and incorporates a piscina on the chapel side of the eastern impost. The high quality of the workmanship is demonstrated by a frieze of grotesque figures and animals running continuously around the interior, punctuated by corbels representing men and animals playing musical instruments. Originally there were rich wall paintings, but they were removed in the early twentieth century. The windows with sumptuous curvilinear tracery once held painted glass; what little now remains is all in the upper tracery. There were once at least 22 shields that displayed the family connections of Margaret and her son, but these are known only from antiquarian notes. The central panel in the east window held the arms of Grey with an inscription in Lombardic lettering reading ‘LE DAME DE GREY’. 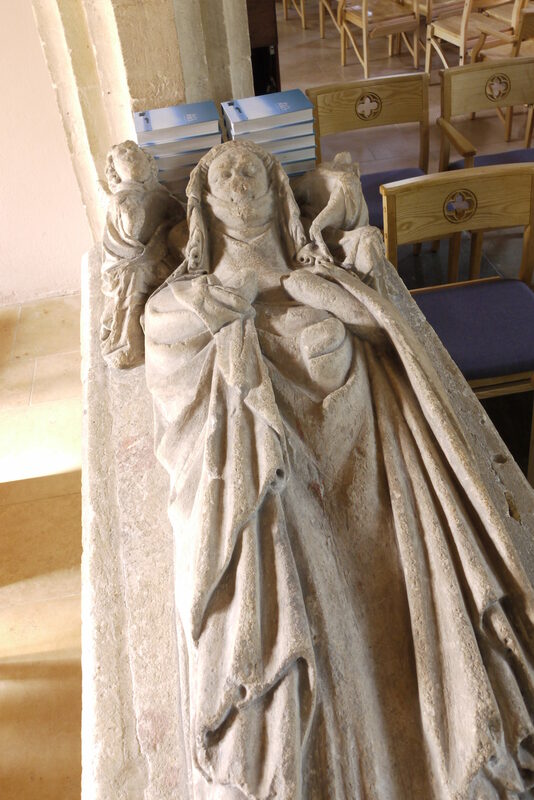 Margaret was born in 1277 as the youngest daughter of William d’Oddingseles of Maxstoke (Warwickshire). She married first Sir John de Grey, who died in 1311, after which she held Cogges as her principal dower manor. By 1319 she had married Robert de Morby, who survived her. 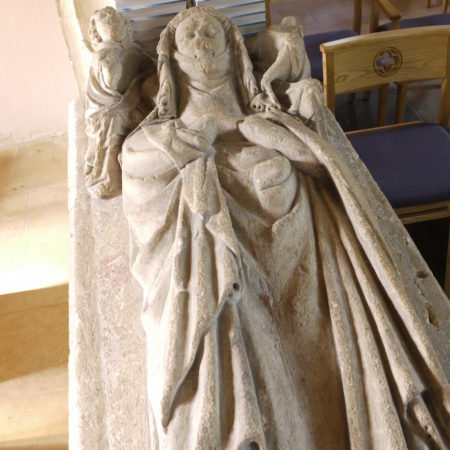 In April 1330 Margaret and her son John were granted free warren at Cogges and elsewhere, but a similar grant only five months later just to John de Grey of Rotherford (Oxforshire) suggests that she had died and the dower had reverted to her son. In 1338 John re-united the manor of Cogges by exchange and it remained in his hands until his death in 1359. He had a distinguished political career and his duties as Steward of the Household would have brought him into contact with craftsmen patronised by the court. This undoubtedly accounts for his choice of high-quality, lavish decoration for the chantry chapel at Cogges. Margaret’s tomb is in a highly visible position in the western bay of the arcade separating the chapel from the chancel. In this position it could be viewed from both sides, encouraging both clerics and the laity to pray for her soul. It is carved from the local Windrush Valley oolitic limestone. There were many quarries by the banks of the river. Since Cogges is very close to the river, the stone may have been quarried nearby. The workmen who made the monument were evidently expert in their trade and produced a fine tomb to act as the central jewel in the elegant chapel in which it is located. 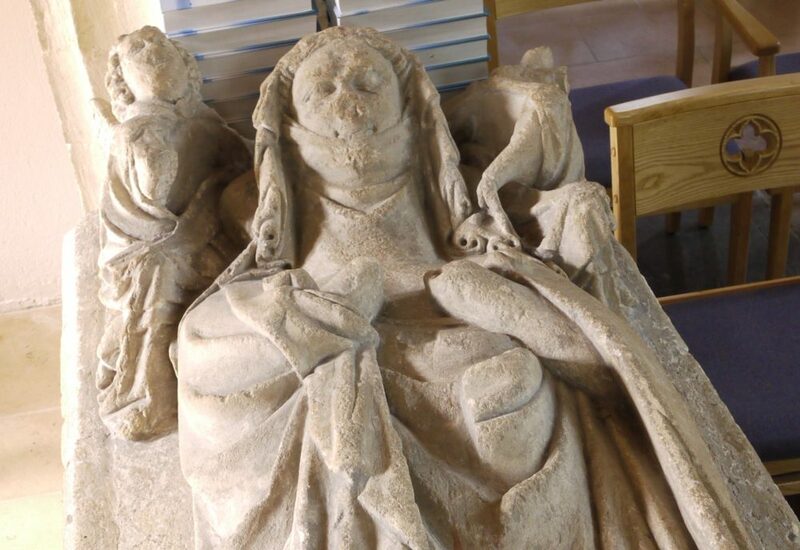 Margaret’s effigy shows her recumbent with her head resting on a pillow supported by two angels. At her feet is a lion, a most unusual choice for a woman; most contemporary effigies of women show one or more pet dogs at the feet. She wears a veil and wimple on her head and neck, and is dressed in a tunic and supertunic covered by a voluminous cloak, which hangs in elegant folds. 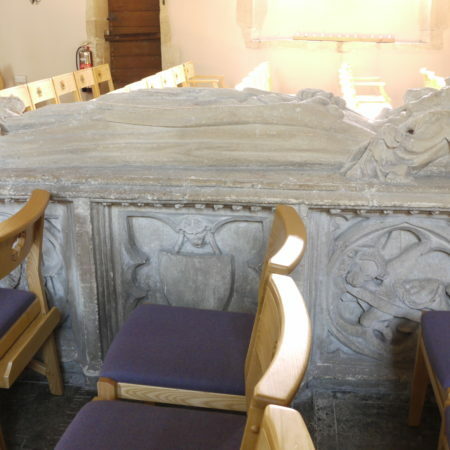 The most interesting element of the tomb, however, is the chest on which the effigy rests. The effigy slab is moulded with a line of ballflower decoration below. On the sides of the chest there is one panel at each end and three on each long side. There are two forms of decoration of these panels, which would originally have alternated, with one panel entirely blank. However, the present arrangement indicates that at some stage the tomb has been dismantled and wrongly reconstructed; it may have been moved from the eastern bay which, as the position of honour, would have been a more likely original location for the tomb. The simpler panels feature shields hanging from lions’ masks, all within a cusped quatrefoil; originally they, like the rest of the monument, would have been painted, but no trace of the arms remains to be seen. The other panel design is far more unusual and may even be unique as they are carved with the symbols of the four evangelists, each holding a scroll on which would have been painted their names. Such symbols often appear at the corners of marginal inscriptions on brasses and incised slabs, but they do not normally feature as a major part of the composition of a monument. The evangelist symbols are based on the biblical imagery found in Ezekiel and Revelation. The image of a man or angel represents the Gospel of Matthew and signifies Christ’s human nature. The lion represents the Gospel of Mark and is a traditional symbol of royalty and power, thus denoting Christ the King. The ox or calf, the sacrificial victim, represents the Gospel of St. Luke and highlights the priestly character of Christ’s mission. The eagle stands for the Gospel of St. John, the evangelist ‘who soars to the heavens,’ because his theology is much more developed than the three Synoptic Gospels: just as an eagle soars above the earth, so John’s theology soars above the other Gospels. The symbols for the Synoptic Gospels probably come from how each one begins. The Gospel of Mark opens with the lines: ‘A voice cries out in the wilderness.’ In the wilderness you can hear the roar of the lion for miles around. Matthew’s Gospel opens with the genealogy of Jesus, and represents Jesus’ human roots. The Gospel of Luke opens with the story of Zechariah the high priest, who offered a sacrifice of a bull on behalf of the nation. These symbols were developed as a way of helping people to remember the different Gospels and the perspectives that they took, especially at a time when most people could not read. J. Blair and J. Steane, ‘Investigations at Cogges, Oxfordshire, 1978-1981: the Priory and the Parish Church’, Oxoniensia XLVII (1982), pp. 37-125. Copyright: Sally Badham with photos by C.B. Newham and Tim Sutton.